You can make these with all-purpose flour, or whole wheat flour for a healthier version. I’ve tried both ways with successful results. Pour in oil and stir with fork until it is thoroughly distributed. Stir in water and knead for a few minutes until you obtain a soft dough. Pinch off 8 sections of dough and roll each piece into a ball shape. Roll out each circle of dough on a floured surface until as thin as possible. Preheat a non-stick pan over MED-HI heat. Dust off excess flour and cook the dough for a minute on each side. Then flip and cook another minute on each side. Be careful not to overcook, as they will become crunchy and won’t wrap well if cooked too long. The tortilla will get brown speckles and will puff up with air pockets. Immediately cover with a towel to keep in moisture and store in an airtight bag. 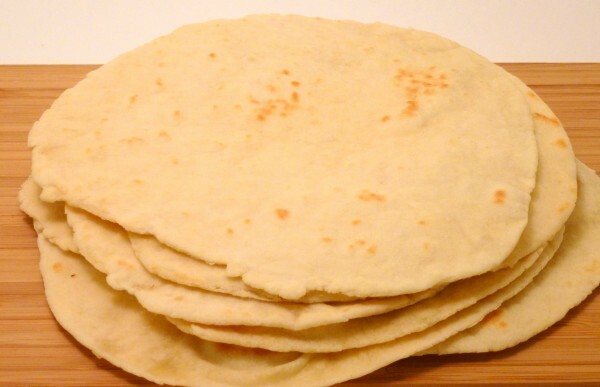 Next up on my list of things to try: corn tortillas!